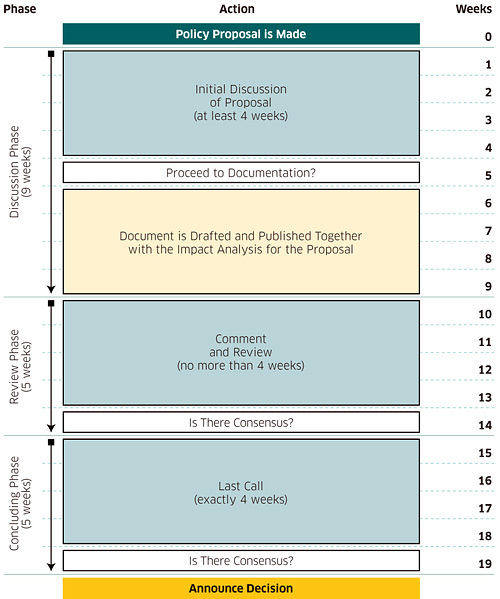 A proposal is discussed publicly in the relevant RIPE Working Group (WG). The proposal is usually submitted via the chair of that WG. If the proposer  is not certain which WG is appropriate for discussion of the proposal, they can send the proposal to the RIPE Chair at policy-proposal _at_ ripe _dot_ net. In some cases, a proposal may need more than one WG's input. In such cases, before the proposal is published, the relevant WG chairs will discuss the situation and decide the WG most suited to discussion of the proposal. Necessary announcements will be made to the other WG(s) so they can follow the discussions. Once a proposal is submitted, it is announced on the Policy Announce Mailing List (policy-announce _at_ ripe _dot_ net), which anyone can subscribe to. This announcement also indicates where discussion on the proposal will take place. This is usually sent to the relevant WG mailing list. The WG chair sets the period for the Discussion Phase and this is at least four weeks. If the WG chair determines that the WG has reached consensus at the end of the Review Phase, the WG chair moves the proposal to a "Last Call for Comments" and the Concluding Phase starts. The Last Call period lasts four weeks. The Last Call announcement is also posted to the WG mailing list and to the Policy Announce Mailing List (policy-announce _at_ ripe _dot_ net). If a grievance cannot be resolved with the chair of the WG the matter can be brought to the attention of the Working Group Chairs Collective (WGCC). Anyone may submit an appeal. This must be submitted to the relevant WG mailing list(s) and to the Policy Announce Mailing List (policy-announce _at_ ripe _dot_ net). The appeal will also be published by the RIPE NCC at appropriate locations on the RIPE web site. Any appeal should include a detailed and specific description of the issues and clearly explain why the appeal was submitted. An appeal must be submitted no later than four weeks after the appealable action has occurred.